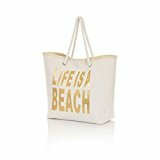 This Wonderful Life Is a Beach Canvas Beach Bag With Rope Handle Is the perfect beach companion, with a choice of designs on our online shop picking one should be easy! With plenty of room for a towel and your suncream. All products are new and in packaging. Measures 55 x 40 cm.